I am planning on selling the K-5, the DA15 and DA70 and upgrading to a K1 body with a new lens or two for the FF. I like the idea of a full FA prime selection (FA 43 and FA 77, to complement the FA31). Does anyone rely solely on this stable of lenses? Do you miss anything? I was also considering a swap with the FA77 to the DFA100 Macro. I like the Macro and WR parts, but I never particularly liked the 100mm focal length (The 70mm DA on the K5 is equal to 105mm). Also considering a DFA zoom, as a WR lens and body sounds fantastic too. I’ve never had a high quality zoom before, only cheap sigmas. Plus my main bugbear with Pentax is Autofocus speed, so I’d imagine these would perform a little quicker. Too many decisions, not enough money. My photography is just general photography, maybe 60% landscape, 40% portrait. Travel, kids, etc. The 31, 43, and 77 are the biggest reasons I bought the K1 and are the basis of my bag. I have older 50, 90 and 100 manual focus macros which are all great. Wider I have several 28 manual and the A 24-50. If I want longer there’s the DA 200 or A 300. Short answer, the 100wr is a great lens, but I would never forgo my 77 for one with the K1. 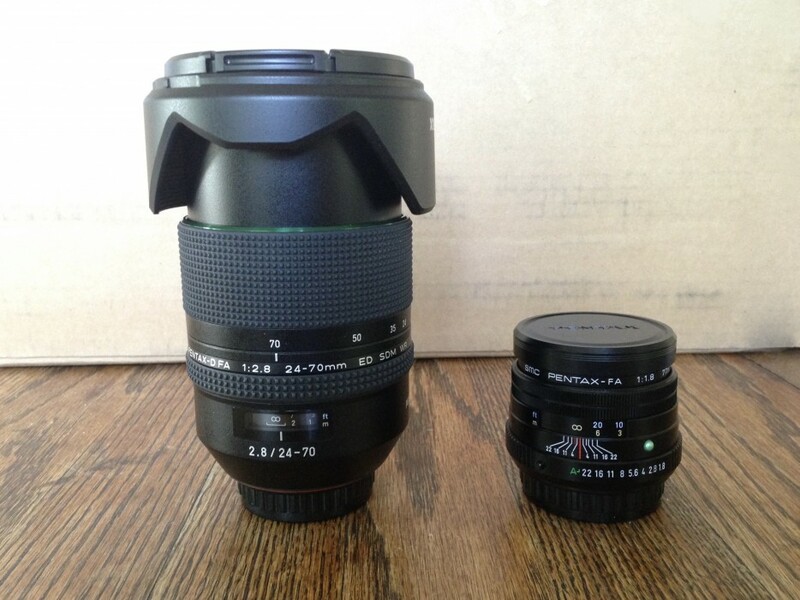 I would go for either the 24-70mm or 28-105mm D FA lenses. Both are quick to focus; the K-1 deserves a modern AF lens as your go-to walkaround zoom, IMO.
. . . I am planning on selling the K-5, the DA15 and DA70 and upgrading to a K1 body with a new lens or two for the FF. . . .
have you considered the D FA * 70 - 200mm F2.8 ED DC AW?
" A 70-200mm lens serves many purposes, especially on full frame. It can be used for portraits (both outside and in a studio), sports, weddings, photojournalism, wildlife, concerts and shows. Such a lens also comes with high expectations. Photographers will expect a high level of optical performance, fast AF, and high reliability. " and yes it is good. Oh my gosh, I was in the exact position in January. I started out with the K-1, and got the 3 FA Limited lenses along with the FA 100mm Macro. Sure you could do everything with that gear. But remember that the 3 FA Limited lenses are screw drive focus, and no weather protection. Now, I miss the modern zooms with very fast focus and weather protection. I got the 15-30 just last week and love it. Now, I'm getting the 24-70 next week. I got a little tired of changing lens so much, and misses the 24 mm focal length. If I had it to do again, I would start with the zooms, and get the Limited lenses later, or not at all. You really can't go wrong either way, as far as image quality. Hope this helps. Due to the price of the D FA 70-200 means I would just have the FA 31, FA50 and 70-200. Thats a pretty big gap, isn't it? With that trio alone you are going to miss the DA15. While its only about 22 mm "equivalent" that is a very useful focal length. Other than that, you will be very happy with the FA limited trio. A WR zoom would be worthwhile. The DFA28-105 would be my choice over the DFA24-70 (I have them both) because of size, weight, cost and range. If you need speed you have the primes. Hold on to the Sigma zoom until you decide what super telephoto to blow your hard-earned on. I'm having an internal argument. At first glance, since you have the 31 and 50 in full frame, I'd say go for the 28-105 or 24-70 and then backfill primes from there. But you say 60% landscape, and that makes me say go for the 15-30 now and add the 28-105 or the 77 depending on how much you're using which primes. If it weren't for the landscape bias, I'd say it's easy. Go for a modern WR fast focusing zoom, pick either the 28-105 or 24-70 based on need for a short telephoto versus speed for low light and a little wider angle, and supplement with select primes from there. And also, you say K-1, but based on what I've seen so far, be sure to look at the K-1 II. The AF speed sounds like it is much improved, and the hand held pixel shift could be of interest depending on the type of landscape photography you are doing. "My photography is just general photography, maybe 60% landscape, 40% portrait." I'm sure the DFA 24-70mm would do you well, designed by the guy who did two of the FA Limiteds. Later on you could add the 70-200 or the future 85mm f1.4. Consensus seems to be on the modern WR SDM zooms. Thanks. One thing I should have mentioned in my original post is that I do a lot of hiking, so weight is a consideration. The 70-200 weighs 2kg! That said, looking at the lens club examples, the 70-200 has really grabbed my attention. I am thinking the best option for me could be the K1+28-105mm package, with the 70-200 D FA. For multi day hikes, I'd just take the 28-105, and for day hikes, the 70-200's weight wouldn't be an issue. K1 ii would be good, but I'd rather spend the money on the 28-105. The 15-30 looks great, but not being able to use a filter is a deal breaker for me. Not having a wide angle would be a small issue, but maybe I will fill that gap later with a Rokinon 14mm or Irix 15mm. Last edited by pmastello; 05-13-2018 at 08:28 PM. Not that anyone would ever know on sight. Depends on where your sight is directed? I'm a bit rough with my cameras and I replace my UV filter every year as they get grubby. Crikey! What do you mean by a bit rough? I never use protective filters and have lugged my gear through many dusty musical festivals, and all over the world including ocean cruises and approaching Iguazu falls by river. The FA31 is a wide angle on the K-1. 14-15mm is extremely wide, and quite tricky to use well. Something in the 20-24mm range would probably be more useful in the first instance.